3 PRACTICAL NURSING PROGRAM REQUIREMENTS: 1. 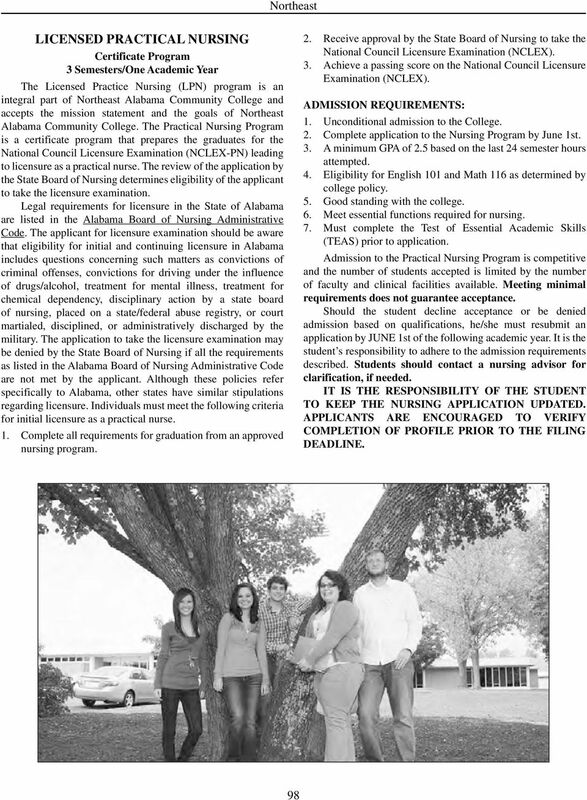 Student must comply with legal, moral, and legislative standards in accordance with the Alabama Board of Nursing Administrative Code. 2. Student must respect the client s right to privacy by protecting confidential information unless obligated to disclose in a court of law under proper authorization or legal compulsion (Alabama Board of Nursing Administrative Code). 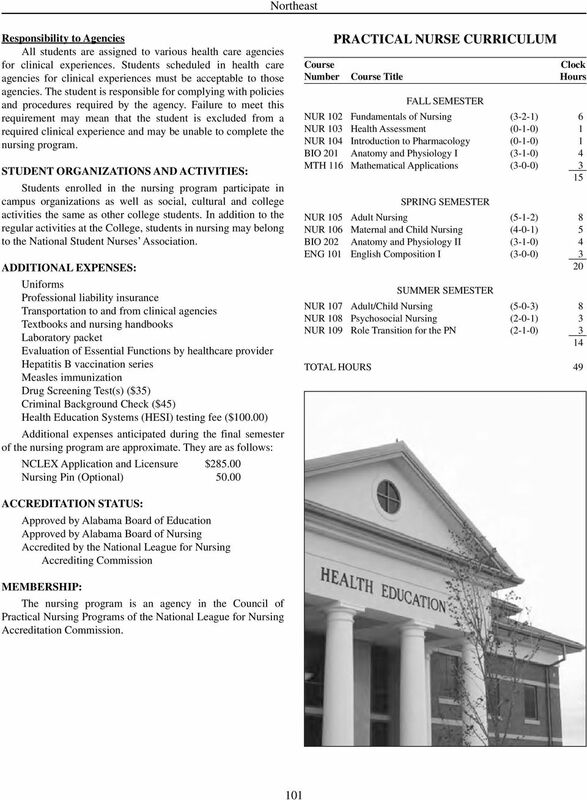 Students may be expelled from the nursing program for failing to comply with this requirement. 3. Students are prohibited from bringing cell phones and recording devices into all clinical setting. Non-compliance with this policy will result in dismissal from the nursing program. 4. Student must take all tests according to the scheduled dates. If student misses a test, he/she must provide appropriate documentation in order to receive a make-up test. Make-up exams will be given during the week of clinical make-ups, prior to the final exam. If more than one exam is missed, all exams must be made up on the same day. 5. Clinical performance involves client safety. 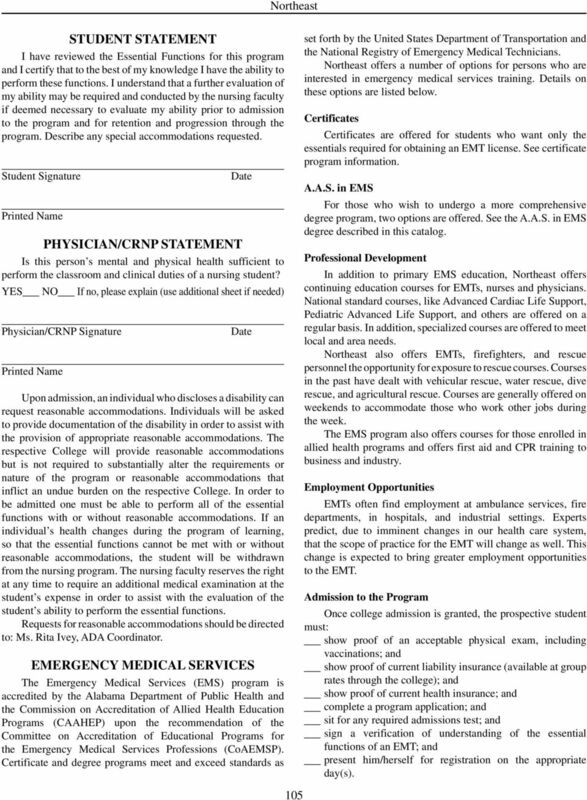 A student may be dismissed from the nursing program if the instructor perceives the student to be a threat to client safety. 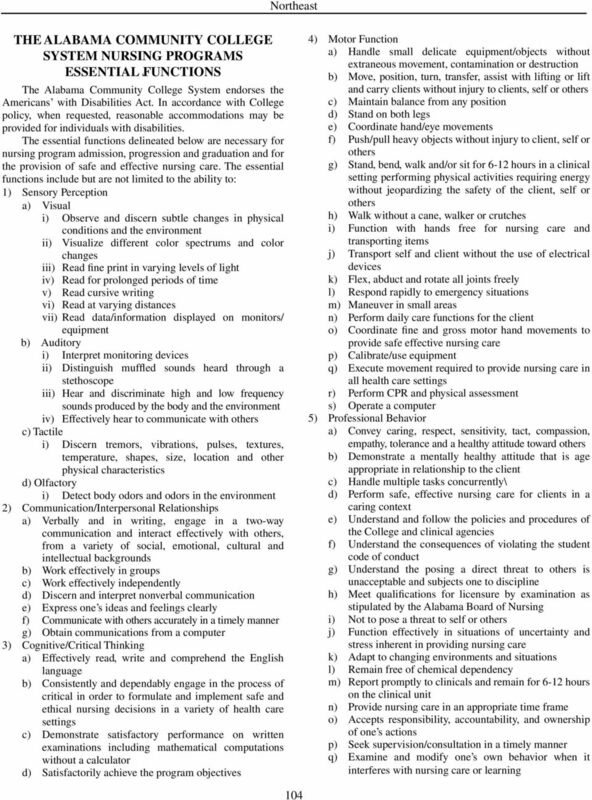 The student must achieve a clinical rating of satisfactory according to the established course criteria in all nursing courses requiring a clinical component. A rating of unsatisfactory in clinical performance will result in a grade of F for the nursing course regardless of any other grading component in the course. A student who has been unsatisfactory in providing safe effective client care in the clinical area will not be allowed readmission into the nursing program. 6. Student is expected to be academically honest. Any student found guilty of cheating may be removed from the program with a grade of F. 7. Student must secure professional liability insurance at the beginning of the academic year prior to placement in a clinical agency. 8. Student must show documentation of current cardiopulmonary resuscitation (CPR) certification at the healthcare provider level prior to placement in a clinical agency. 9. Student is required to obtain a health evaluation by a qualified health practitioner on the form provided by the nursing department. (Due by the first day of class) 10. Student is required to obtain an evaluation of the Essential Functions as determined by a qualified health practitioner on forms provided by the nursing program. The evaluation must be submitted by the first day of class. Additional health examinations may be required depending on physical or psychological alterations which may occur during the program of study. 11. With occupational exposure to blood and other body fluids, the student is at risk of acquiring Hepatitis B virus infection. Clinical agencies encourage students to receive a series of three Hepatitis B vaccines. The student must receive the first vaccine prior to attending the first day of class of the Northeast 100 admitting semester. Students may refuse the vaccine series by signing a declination policy provided by the nursing department. It is the student s responsibility to obtain the vaccine from their personal healthcare provider. 12. As required by the clinical agencies, the student is required to submit to a pre-clinical drug screen. Additionally, random drug screens may be required should the student exhibit behaviors indicative of substance abuse during a clinical experience. Drug screening test(s) will be at the student s expense. 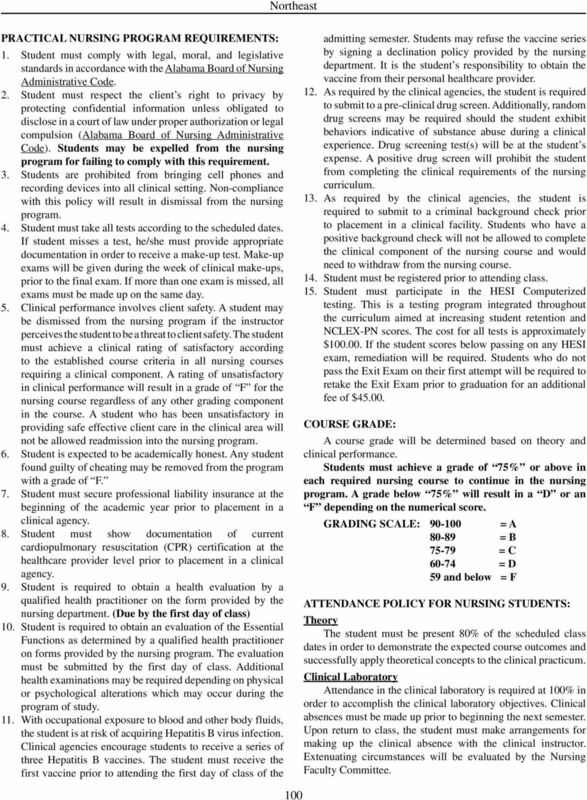 A positive drug screen will prohibit the student from completing the clinical requirements of the nursing curriculum. 13. As required by the clinical agencies, the student is required to submit to a criminal background check prior to placement in a clinical facility. Students who have a positive background check will not be allowed to complete the clinical component of the nursing course and would need to withdraw from the nursing course. 14. 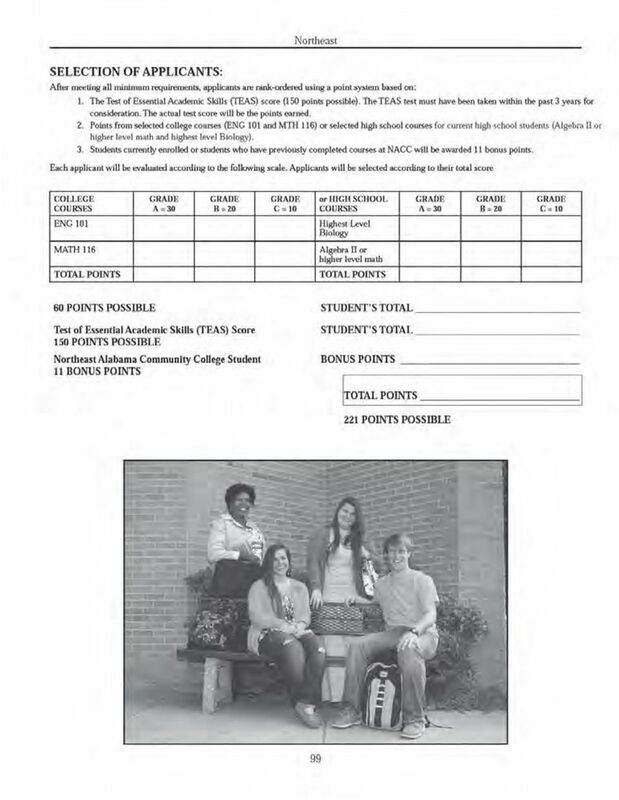 Student must be registered prior to attending class. 15. Student must participate in the HESI Computerized testing. 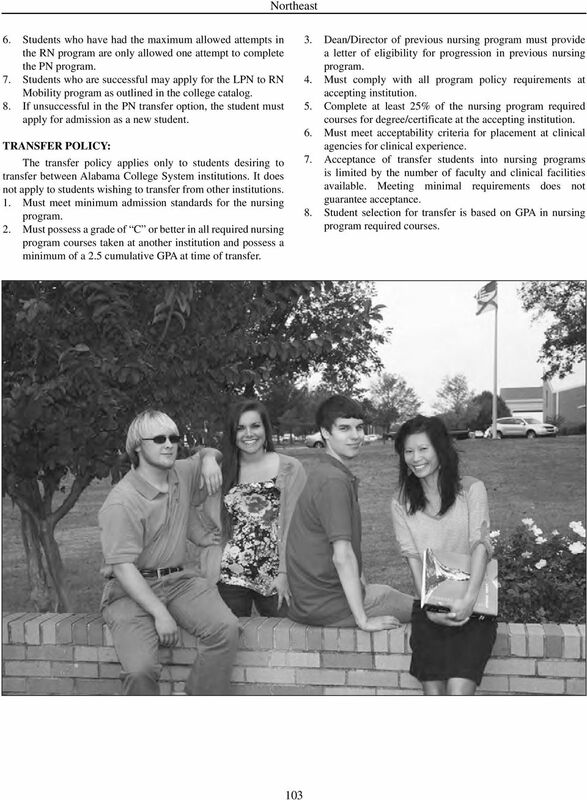 This is a testing program integrated throughout the curriculum aimed at increasing student retention and NCLEX-PN scores. The cost for all tests is approximately $ If the student scores below passing on any HESI exam, remediation will be required. Students who do not pass the Exit Exam on their first attempt will be required to retake the Exit Exam prior to graduation for an additional fee of $ COURSE GRADE: A course grade will be determined based on theory and clinical performance. Students must achieve a grade of 75% or above in each required nursing course to continue in the nursing program. A grade below 75% will result in a D or an F depending on the numerical score. GRADING SCALE: = A = B = C = D 59 and below = F ATTENDANCE POLICY FOR NURSING STUDENTS: Theory The student must be present 80% of the scheduled class dates in order to demonstrate the expected course outcomes and successfully apply theoretical concepts to the clinical practicum. Clinical Laboratory Attendance in the clinical laboratory is required at 100% in order to accomplish the clinical laboratory objectives. Clinical absences must be made up prior to beginning the next semester. Upon return to class, the student must make arrangements for making up the clinical absence with the clinical instructor. Extenuating circumstances will be evaluated by the Nursing Faculty Committee. 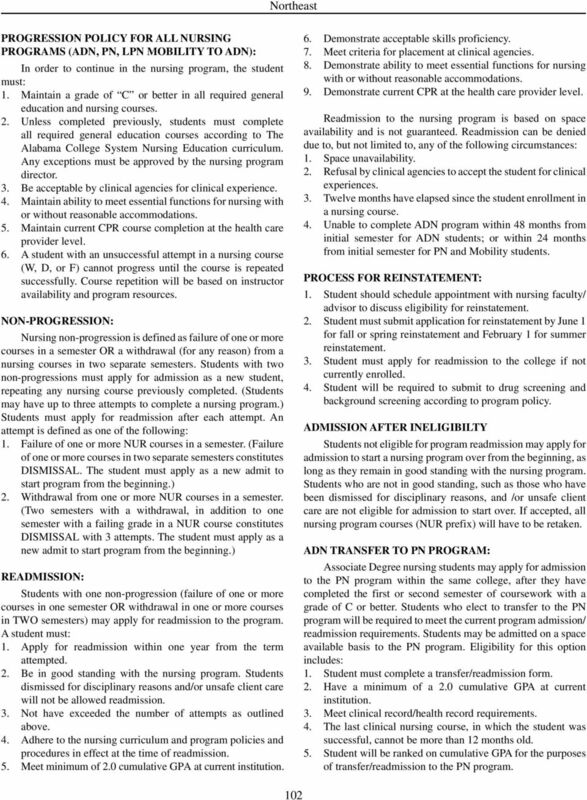 *Note: Meeting the minimum requirements, as listed above, does not guarantee admission into a nursing program.